Promoter Ged Rathbone has given Panthers the green light to race on in 2017. The Middlesbrough-based businessman has openly questioned his future in the sport in recent weeks. But he has now arrived at a decision that will delight Panthers fans - he is to stay on at the helm and has already thrashed out a two-year extension deal with major backers T Balfe Construction. 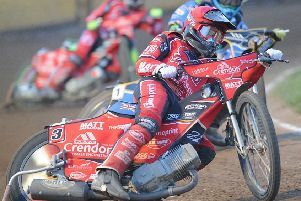 Rathbone said: “It was important to take a bit of time to have a good think about what I’ve done in our two seasons at Peterborough, and whether I could continue going forward. “After doing that, I feel happy to carry on and hopefully we can continue the good work we have achieved so far. “Admittedly we had a very difficult season on the track this year and learned a lot of valuable lessons as a result. “We have received plenty of criticism for the number of changes we made to our team, but we simply tried to improve whenever the opportunities to do that presented themselves. “I’ve read a few comments on social media and internet forums that we attempted to buy the title - that couldn’t be further from the truth. “We run a very tight ship that has to be self sufficient, and making the major changes towards the end of the season, when we brought in the likes of Kenneth Bjerre and Anders Thomsen, actually reduced our wage bill. “Things didn’t quite work in the way we wanted in terms of making the play-offs, but life goes on and we’ll be back better and stronger next season. “It is a fantastic boost to have our sponsors, T Balfe Construction, back on board as well. They are great backers and always at the end of the phone if we need any advice. Rathbone revealed the club’s management team are already considering potential rider signings for 2017. And he insists regaining their home advantage at the East of England Showground will be a priority after two seasons in which they have been let down by results on their own Alwalton shale. Rathbone added: “We’ve already spoken to a number of riders about next year, but we can’t press on too much until the rules are set in stone at the British Speedway Promoters’ Association AGM. “We have a general idea of where we want to be and that is putting together a team that is capable of winning regularly at home. We need to entertain our fans and give them success. “The crowds were consistently good for the vast majority of this season and I understand why they dipped on certain occasions due to different race-nights or hastily-arranged meetings.